While we've had figures of Mega Man before - a lot of them, in fact, ranging from high end Japanese figures to mass market releases you found in average department stores - this is the first toy we've seen of the series big bad, Doctor Albert W. Wily! If you've read my review of the Mega Man figure from this line you already know how much I dig what Funko is doing in this scale and for this price, and my collection is at such a sizeable state that character variations rarely grab me. Two repaints without any funnew accessories? No thank you, Sam! 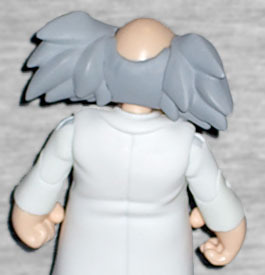 But enter the final figure in the line, Dr. Wily, and I knew he had to be mine! 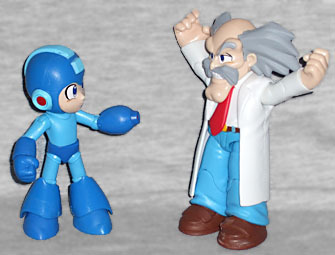 Dr. Wily stands slightly over the 5" height advertised, pushing five and a half, but in great scale with the Mega Man. 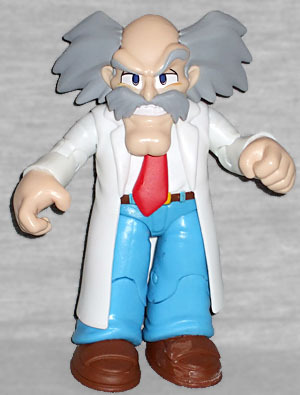 While Dr. Wily was typically taller than his Rockman enemies he wasn't a towering figure, so this looks right, and slots right in with your various similarly-scaled videogame figures. This is a great sculpt, capturing the character looking suitably twisted and deranged, his face twisted in a sneer. He's wearing his labcoat and tie, which matches the most common iconography of the character, making him an excellent addition to your videogame antagonist collection; he's a blast to have sneering next to Bowser or Doctor Robotnik alike! Paint is, again, where you need to be careful. I had to hit a couple of stores to find a Wily with a good paintjob on the face, so it's worth handling these guys in store rather than buying online. That said, finding the right one scores you a great paint job; like Mega Man, Wily's overall paint is simple but effective, with nice touches on his hair and neat paint apps on his clothing. Articulation is more limited compared to the spry, nimble Mega Man; Wily has balljoints at the shoulders and legs, but then pegs at the knees and elbows, and additional movement at the wrists and neck. Because he's a chunky sort he doesn't have the kind of movement of his nemesis and the articulation here, while decent, doesn't allow for many poses. The issue is that, unlike Mega Man, he doesn't have any interchangeable parts or accessories, which is a shame. His hands are ideal for holding some kind of remote control or something, and he doesn't have any to switch to, like fists to pound. I'm thinking this is a sacrifice for the size of the figure, which is notably taller than the others in the line, but it's still a little bit of a missed opportunity. That said, it doesn't get in the way of this being a very good figure, and an excellent addition to any videogame collection. I'm chuffed by the job Funko is doing here, especially the way these toys work alongside other popular lines currently for sale, especially the stellar World of Nintendo, which is this series' closest analogue, both in quality and in price.